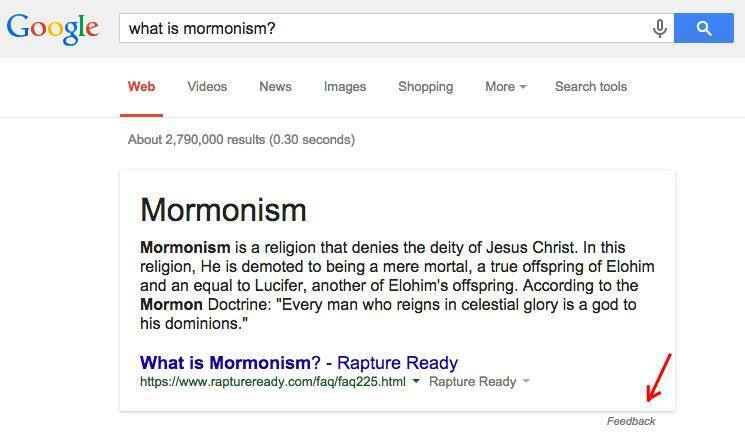 After my friend Tanner searched “What is Mormonism?” on Google and got the answer that’s “…a religion that denies the deity of Jesus Christ,” Mormons went crazy on Facebook. Google offers a “Feedback” link to users and my guess is they’ve gotten over 5,000 feedback comments from Mormons around the US. Spread the word and have Google change the incorrect information. UPDATE: GOOGLE IS SHOWING SOMETHING DIFFERENT NOW. THANKS FOR THE EFFORT. Previous Post Why Making a List on Twitter is Important in Public Relations?